This was meant to be a fishing Blog telling about our trips fishing for mackerel and striped bass. 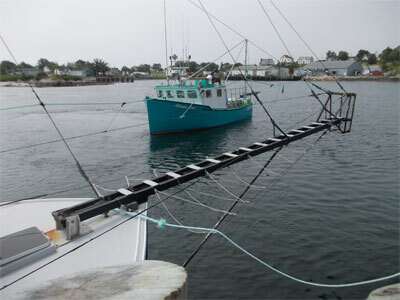 However, last week-end we headed to Lockeport to fish for mackerel, to find that the local Sea Derby was in progress. We fished for a short time at our usual pier, but nothing was biting, so we went over to the Government wharf to see what was being brought in. Several fishing boats were waiting to land their catch. 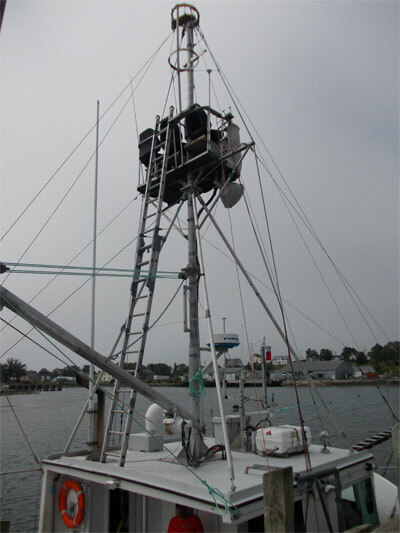 This boat above has a long look-out platform for spotting sword fish. I liked the name of her. It also has these seats up high for spotting the fish. 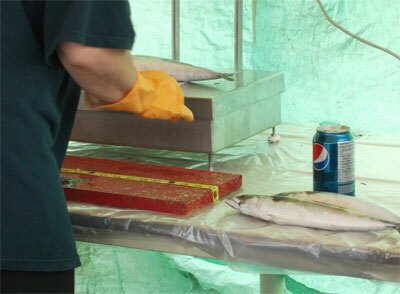 Some cod had been landed and were being weighed and measured. There doesn’t seem to be a limit to the size taken, but there is a maximum of 10 rule. I remember when we used to catch huge cod on the West Coast of Scotland in the 70’s, it’s good to see they are returning. Mackerel are plentiful at this time of the year. 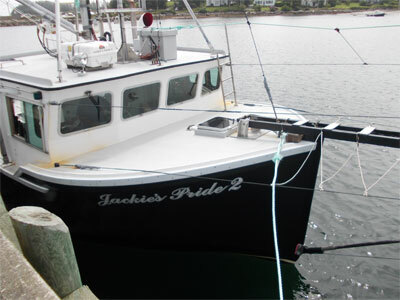 We caught 14 one day at Lunenburg and 8 at Lockeport in a very short time. The Governement body, the Department of Fisheries, was present to check what was being landed. 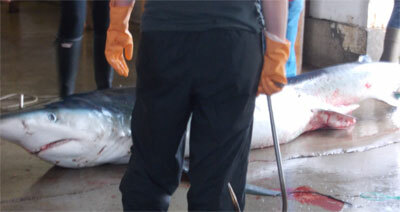 The shark had to be winched from the boats up into a shed. 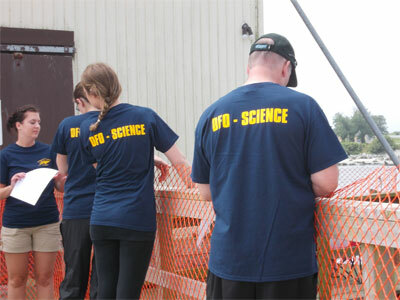 Where they were weighed, and measured and the contents of their stomachs examined. This one weighed about 350lb! I had never seen a shark up close before. 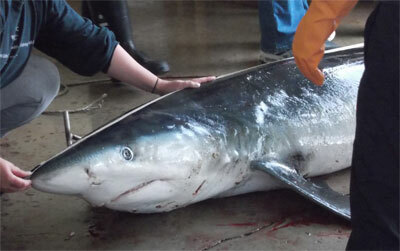 These were Blue Sharks – what a beautiful colour! We had a very exciting day and might go fishing at the Sea Derby next year. 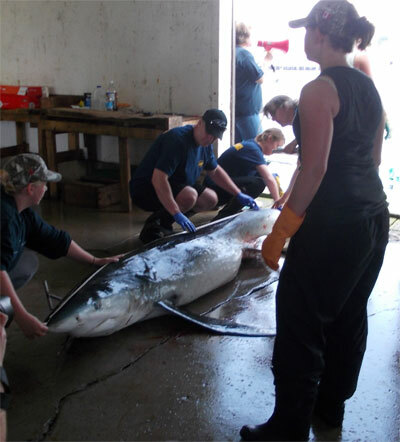 This Great White Shark was caught in a fisherman’s trap, last year, in the Bay of Fundy. I have taken the photograph from a CBC page. 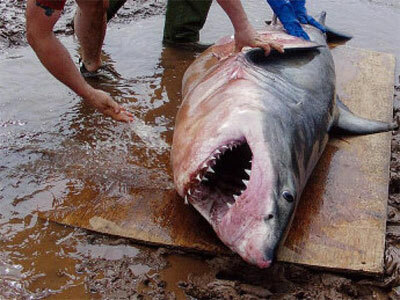 It was a baby female, 3 metres long and weighing 272 Kg. This was taken from the CBC report of August 17th, 2011. 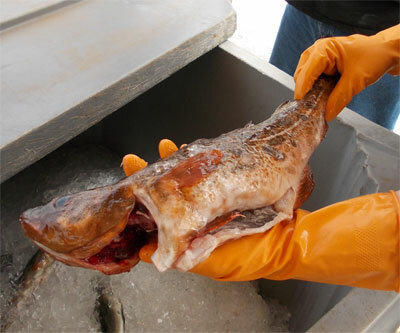 Steve Campana, head of the Canadian Shark Research Laboratory, said the shark was likely looking for fish when it got trapped.”They’re interested in fish and perhaps small seals and dolphins. It’s very unusual for a great white to attack a person and usually when they do, it’s because they look up and see a surfer on a surfboard and it resembles a seal, which is one of their favourite prey,” said Campana. 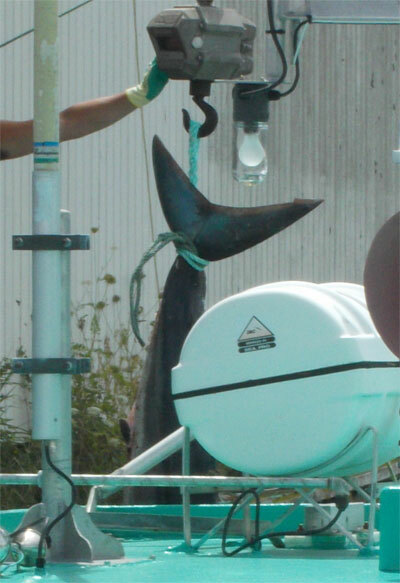 But this Mako, caught in 2004 was a giant! 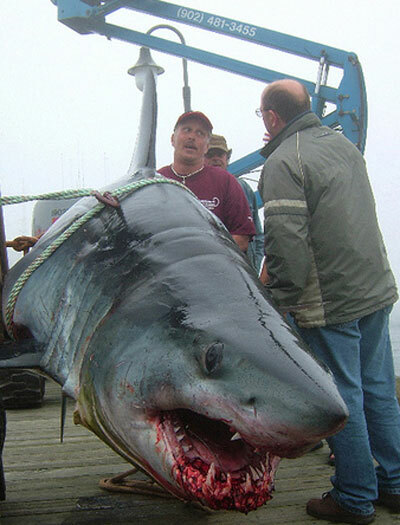 It was caught by Jamie Doucette, when he was fishing in the Annual Shark Scramble at Yarmouth, NS. 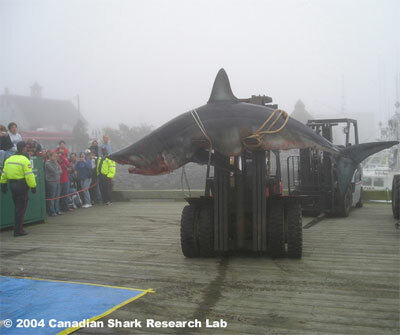 The shark weighed in at an astonishing 1,082 pounds and was a Canadian record. I’m really not sure what I’d do if I caught any of these huge fish. There is another Shark Derby on 25th August at the Seafest at Brooklyn, Liverpool. We’ll go along and see if there are any records caught there.